Strawberries — tasty and useful berry, fruiting period which falls in summer. Berries purchased in the store, have unexpressed taste and overpriced, besides their growing use harmful chemicals. The best way is to freeze fresh strawberries, whole or in jams at home. To freeze strawberries, to preserve its wonderful taste and aroma, it is necessary to properly gather the berries and prepare them for the freezing process. Best time for picking strawberries from their garden — in the morning before the dew, when the berries are as flavorful and dry. It is not recommended to collect the strawberries during extreme heat or after a rain, then the berries are tasteless and crumbly. Collected strawberries better not to wash, you can blow using a hair dryer. The berries must be frozen within 3 hours after collection, because at this time the strawberry is a protective film, which prevents the formation of viruses and bacteria. If you overexpose the strawberries more than 3 hours or purchased on the market, be sure to wash the berries. Ensure that the water is glass and the berries dry. 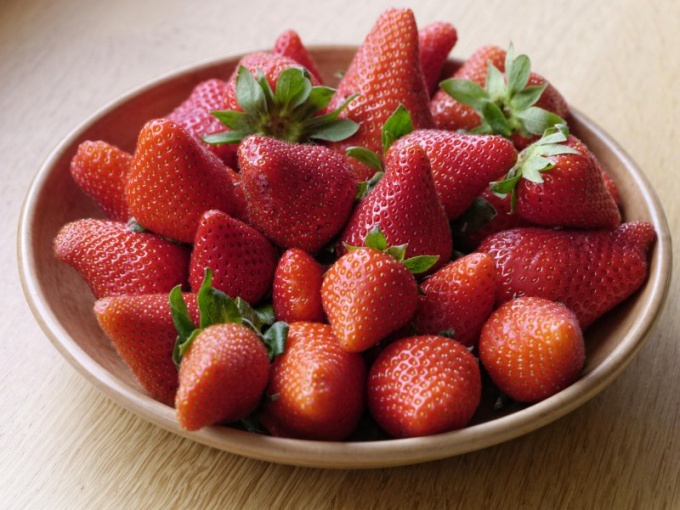 Then try: remove the stems, separate the rotten and soft strawberries and berries with spots. You are now ready to freeze. Clean and dry berries of medium size, lay in a single layer on a tray or cooking foil and place in the freezer for 1.5-2 hours. During this time the berries will freeze and become solid. Remove the strawberries from the refrigerator, put in special containers or plastic bags and put in the freezer, designed for storage of fruit and vegetables. If you use plastic bags for freezing, then before you put the bag in the refrigerator, remove all the air and tie. Winter thawed the berries, put in ice cream, filling for cakes, to make strawberry juice, juice and add to smoothies or tea. Keep in mind that you need to thaw only the amount of berries that you are going to use. Re-frozen strawberries will lose its appearance and taste. To freeze a whole use fresh strawberries, which was not soft or overripe. After preparing the strawberries put it in a special container and pour the sugar on top of the following calculation: 1 kg of berries need to take 200 grams of sugar. Cover the container with a lid and send the berries in the freezer of the refrigerator. Take the right amount of strawberry, peel, wash and dry naturally. To determine the right ratio of strawberries and sugar is possible according to the following pattern: 400 g of berries, you need 100 g of sugar. Place the strawberries in a blender, add the sugar and whisk until smooth, then put the strawberries in special containers, glass jars or plastic bags (optional), and then send in the freezer of the refrigerator. Strawberry jam is beautifully kept throughout the year, you can add it to the filling for pies, pancakes with honey, etc.